The Dahle 40330 Small Office Paper Shredder will shred 6 / 8 sheets at once into 1/32" x 7/16" level 6 cross cut pieces. It offers a 10 1/4" feed opening that empties into an 23 gal. waste compartment, and runs extremely quiet thanks to vibration absorbing rubber shock mounts. Additional features include auto on/off, reverse, continuous run operation. 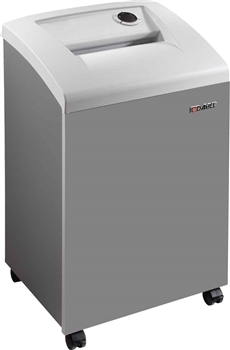 Plus, the Dahle 40330 cross cut shredder is equipped with SmartPower to reduce power consumption and conserve energy.